Plums are a favorite fruit around these parts and I do all kinds of yummy things with them. Plum jelly. Plum Apple Sauce. Asian Plum Sauce. But one of our favorite canned plums recipes is this one for Spiced Plums. 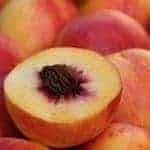 You can use Italian plums, or wild plums, or regular ole plum plums. This recipe uses a light syrup that is gently spiced, with an added splash of alcohol (namely Brandy) if you choose to add it. I suppose, if you wanted to, you could skip the water altogether and just can these in straight Brandy. These are great served room temperature with pound cake or hot as a cobbler or crisp. I image they’d be pretty good with ice cream, too. I’ll have to give that a try soon. 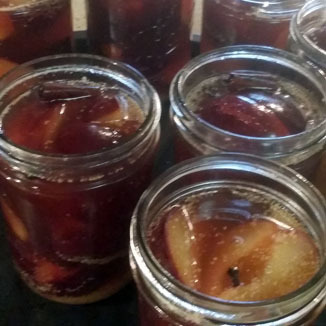 This recipe makes anywhere from 5 – 7 pints depending on the size of your plums and how tightly you pack them in the jar. I usually have a little syrup left over and I’ll can that up along with the jars of plums. The syrup is good mixed into a fruit salad or thickened up for a bread pudding sauce. Or to sweeten oatmeal or even rice pudding. There’s no end to what we have found to do with it. I’m going to try to hide some and add it to my next batch of water kefir. The plums can be processed in either a water bath canner , which is what you’ll see in the pictures, or a pressure canner . Instructions are included for both canners. 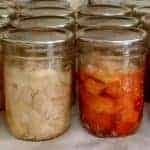 If you’re new to canning, or want a refresher, please click here for general canning and safety guidelines. In a large pot combine the water, Brandy if you’re using it, honey, orange juice, and cinnamon sticks. Bring that fabulous concoction to a boil. Reduce the heat and simmer it for 10 minutes, stirring frequently. While that’s simmering wash and pit the plums. 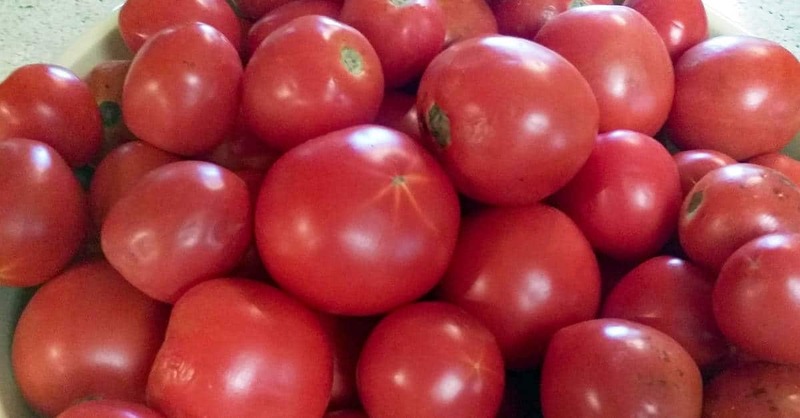 Depending on how big they are, cut them either in half or in quarters. For very small plums you can leave them whole, but prick the skins so they don’t burst during processing. Cuz that would just be sad. After the syrup has simmered for 10 minutes, add the plums. Bring the plums and the syrup back to a boil, stirring frequently, the remove it from the heat. To each hot pint jar add 3 cloves and 1 tsp of orange zest. Fish the cinnamon sticks out of the syrup and add one to each jar. I usually start with the 5 jars and add more if I need to. Now add the plums to the jar leaving 1/2″ of headspace. Try to fit them in as tightly as possible without squishing them. Sometimes it feels a little like playing Tetris. Only with food. Hot food. That could, just possibly, burn your fingers. the syrup is hot too! Next, ladle the hot syrup over the plums, using a canning funnel . The funnel not only helps get the stuff actually inside the jars, but it also helps keep the stuff off of the rims of the jars. Then, remove the air bubbles with your handy dandy little air bubble remover thingy and top off with the syrup as needed, again, leaving 1/2″ headspace. Wipe the rim with a clean cloth dipped in vinegar (vinegar cuts through the syrup), seat the lid, and put the rings on finger tight. Fill and close the remaining jars. Process in a boiling waterbath canner for 20 minutes for pints or quarts. Or process in a pressure canner for 10 minutes at 6 pounds pressure for pints or quarts. Whichever canner you use, don’t forget to adjust the time or pressure according to the altitude chart. I actually had some syrup left so I canned that too! After processing, allow the jars to cool, undisturbed, 12 to 24 hours. Don’t forget to check the seals before you put the jars away. What would you eat these beauties with? Plums are a favorite fruit around these parts and I do all kinds of yummy things with them. This Spiced Plum recipe is one of our favorites. In a large pot combine water, honey, orange juice, and cinnamon sticks. Bring to a boil. Reduce heat and simmer for 10 minutes, stirring frequently. While that's simmering wash and pit the plums. Depending on size cut them either in half or in quarters. For very small plums you can leave them whole, but prick the skins so they don't burst during processing. After the syrup has simmered for 10 minutes, add the plums. Bring the plums and syrup back to a boil, stirring frequently, and remove from heat. To each pint jar add 3 cloves and 1 tsp or orange zest. Fish the cinnamon sticks out of the syrup and add one to each jar. Now add the plums to the jar leaving 1/2" of headspace. Try to fit them in as tightly as possible without squishing them. Cover the plums with the hot syrup. Remove the air bubbles and top off with syrup as needed, again, leaving 1/2" headspace. Wipe the rim with a clean cloth dipped in vinegar, and adjust the lid. Fill and close remaining jars. Process in a boiling waterbath canner for 20 minutes for pints or quarts. Or process in a pressure canner for 10 minutes at 6 pounds pressure for pints or quarts. Whichever canner you use, don't forget to adjust the time or pressure according to the altitude chart. 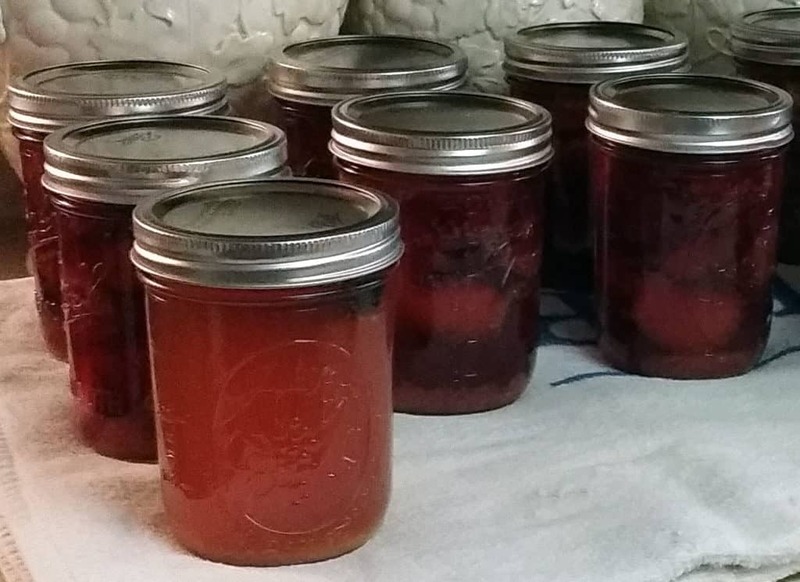 After processing, allow the jars to cool, undisturbed, 12 to 24 hours. Check the seals before you put the jars in storage. 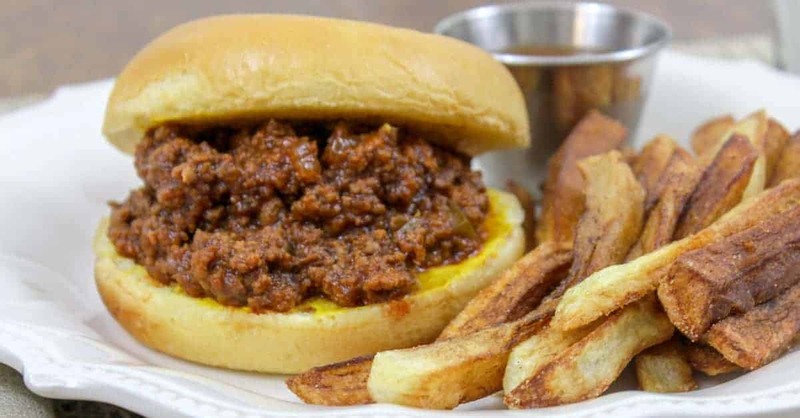 If you don't want to can this recipe, cut it way down. These will keep in the fridge for about a week. That looks so good! Plum jelly is one of my favorites. I keep hoping I’ll find a wild plum tree on our farm, but I may have to break down and plant one. I don’t think I’ve ever had spiced plums, but you make them look really good! Looks yummy, thanks for sharing with us on the homesteader hop! Thanks for stopping by, Jamie. This recipe was SO good. 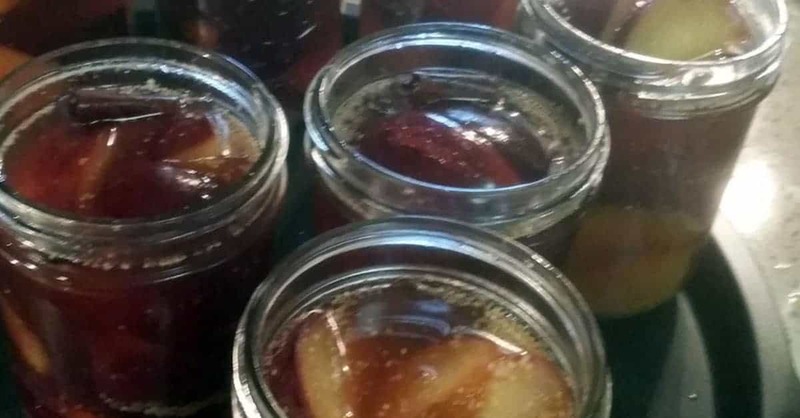 I had a ton of juice left over from the first batch so I added 4 more pound of plums in and canned those, too. Hi Stephanie! I have to admit, I’m a little addicted to these. lol I’m glad you got a bunch more canned! Blessings! I did the same thing. Only ended up with 7 jars total. Totally forgot to add the orange zest, so I added it to the spiced plum jam I made next. I am going to use the left over syrup for sangria- after all this work, I deserve it! Hi Jennifer! Plum sangria sounds mighty tasty! 🙂 I bet the orange zest was great in the jam too!